Underneath a gray night sky with a crescent moon, a cigarette and condom roast marshmallows. “You can keep a secret, right,” the cigarette asks. “I guess,” the condom replies. This is from one of the first online comic strips featuring the nameless cigarette and condom that happen to be roommates. Their surreal dialogues can be found on “Dos Factotum” (www.dosfactotum.com), where the two have been syndicated throughout the world and running since the Aegean Bronze Age. Or, the adventures of the cigarette and condom began in September 2004 when Ryan Grim, 19, and David Gonzales, 20, moved in together and decided to make a comic. The two NYU sophomores first met during their freshman year through the classic means of living in the same dorm, but on different floors. “Actually,” Grim, an architectural design and fine arts major said, “we lived in different towers. Our dorm on Third Avenue was huge.” The two met during freshman orientation, through a mutual friend. “A night later, he came to my room. I don’t think he left after that,” Gonzales replied. Grim, a native of Dayton, Ohio, was interested in classical art as a child. But as time grew, he found himself reading more comics and beginning to explore the punchline rather than point of views or structure. “I really like art, but comics were fun,” Grim says. He cites “Calvin & Hobbes” and even “Dilbert” as favorite examples of writing and structure. Despite this, he’s a self-described non-fan of comics, leaving that to his partner. Gonzales, from Louisville, Colorado, which is “right outside Boulder, so I just say I’m from Boulder if anyone asks,” was making comics since high school. “Dave is more of a comic person,” Grim remarks. Gonzales’ original strip was a one-panel “political satire” for Monarch High School, “a school that was named for a mine underneath it, which itself was named for the butterfly.” After six months of writing the untitled comic, he became a staff writer at the paper, but focused on the comic. On this early afternoon, Gonzales and Grim are sitting in their Greenwich Village dorm, blinds closed against the light. Gonzales is wearing a pair of gray slacks with a white “New York City” t-shirt. Across from him on the bottom bunk in a rumpled blue button-up and black slacks, Grim is smashing out his fourth cigarette since he began talking. The first collaboration between them happened last year when they created a fake website for a band called “Resin Hound.” The two wrote song lyrics, designed album covers, and had a photo shoot complete with a make-up artist to “alter [them] a little bit” and then had an entire photo gallery for the fake band. As it worked, Grim handled the writing and structure while Gonzales knew how to program and came up with the idea. After a few months, Gonzales stopped paying for bandwidth and the site went down. 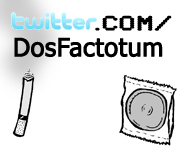 “You could say ‘Dos Factotum’ is the second incarnation,” Gonzales says, as he lights another cigarette. “I don’t know how computers or how our website is accessible to everyone. Dave is doing all that stuff, and I gave him $10,” Grim says. Gonzales quickly explained that the site, hosted by GoDaddy.com, costs $10 a year plus a one-time fee of $5 to register the name. The benefits of GoDaddy are “high bandwith and low memory, which is perfect for the comic,” according to Gonzales. The initial concept for Dos Factotum, which has “no real meaning” according to Grim, came from a friend’s “fake” noise band at Ohio State University. After lifting their name, “because it sounded cool”, the two planned to put the strips on the Internet in season increments rather than a weekly or daily production schedule. According to Gonzales, the original plan was to create a cliffhanger at the end of each “season”. This soon broke down into random strips, until the third season, aptly titled “B-Sides and Rarities” which involves comics “from the vault” dating back to the 1920, 1810 and the Aegean Bronze Age. The second half focuses on the comic’s syndication from Ireland, Japan, and Germany. “Or, you make a pile on my desk, “Gonzales replies, opening a drawer filled with drafts for the next three seasons cluttered everywhere. Word about Dos Factotum spread after the comic appeared in a two-page spread in the Fall 2004 edition of NYU’s comedy magazine “The Plague”. Prior to that, Grim and Gonzales printed up stickers advertising their strip, and then distributed them throughout the school. After the combined effort, Gonzales said that they’re up 500 individual hits from the Manhattan area than they were in November 2004. “What I remember being worried about is that the only sense of humor we cater to is our own. Obviously the cultural jokes and the past jokes could range from really offensive to ‘Ah Bartleby, Ah Humanity’ which is really literate. Some [strips] were mildly funny, but I think the entire Dos Factotum concept is really overthought,” Gonzales says, putting on his jacket as he’s about to leave to meet a friend and go over a script they’re writing. Grim crushes another cigarette, threatening to smash their glass ash tray into shards. Gonzales pauses to explain two tattoos on his left forearm, the Sanskrit ‘Ohm’ and diagram of mathematical order in the universe.